After attending Embedded World last month in Germany it was clearer to me than ever before – the embedded PC industry is not dissimilar to the desktop PC industry 30 years ago. When Dell entered the PC market back in 1984 and in the years shortly following, there were 430 PC companies who were each trying to compete based on some level of unique customization they could offer. Dell turned all this upside down with their direct configure to order model. Today there are 3 PC companies making up 60 percewent of the share. Why? Because scale matters, and because customers realized that price, reliability, and availability trumped customization. Early on in the PC industry often times individual teams within a company were purchasing and managing their own computing – and each business owner had unique requirements. When IT departments came into the picture they valued consistent, easy security and manageability which was another reason why they wanted to standardize their IT infrastructure with a single or maybe a few PC providers. 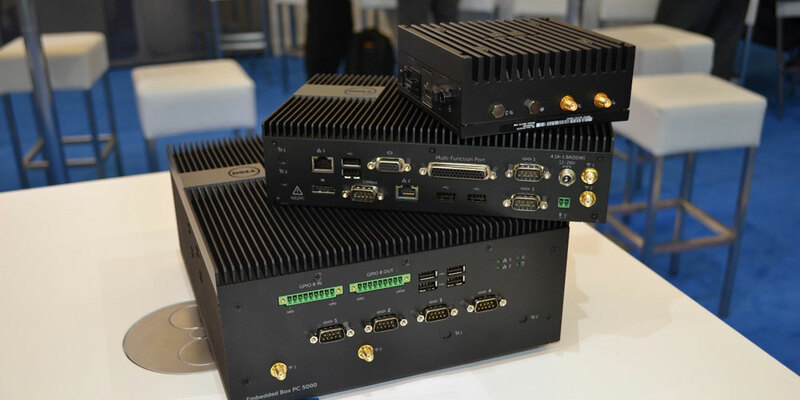 At Embedded World there were over 300 unique embedded PC providers showing off their broad portfolios and touting their customization capabilities. In one case I had a vendor offer me a catalog of their ‘IoT’ PC solutions which was 250 pages long (really). As jaw dropping as that was, it was nothing compared to when the salesman continued to say “but wait… you should also take our Industrial PC catalog” which was another 250 pages! From my assessment, this industry sees this a normal. Vendors really act more as Original Design Manufacturers (ODMs) creating a custom solution (4 USBs, 3 VGA ports, 2 PCI expansion slot, 8 GB of RAM, and a partridge in a pear tree) and then they put that in a catalog, and try to sell it to as many other customers as possible since they have already invested in the engineering. The challenge with this model as it converges with the new IoT market is when you value customization over everything else, you end up with many challenges when you try to scale. First you have the challenge of availability, just because a product is in a catalog does not mean you can actually buy it. Often times it can take 12-18 weeks to get the product with minimum order quantities (MOQs) of thousands which does not give you very much flexibility if you are integrating this into your broader solution. The next challenge is reliability, because when you are offering hundreds of custom systems you can only spend one hundredth of the time testing the ruggedness of that particular system. You also do not have the volumes to guarantee the availability of all the components in the system, which means you might have to switch a component in the middle of a production lifecycle. To the end customer this means you get a new shipment of 1,000 plus units in (because you had to buy that many) and you go to load your image and some of the drivers are different causing a pretty significant engineering lift to go back and test everything. Dell stood out at Embedded World. Not only were we the only leading IT provider present at the show, but when you came into our booth the story was pretty simple. Here are our four edge computing products, which we can configure differently based on your core use case needs. We offer the highly configurable Edge Gateway 5000 which is our scalable workhorse and the small and mighty Edge Gateway 3000 which is design to have uncompromised connectivity for mobile/remote use cases and tailored I/O. In addition we offer the highly configurable Embedded Box PC 5000 with I/O and storage expansion slots and the Embedded Box PC 3000 with a smaller footprint, tailored I/O, and lesser compute. That is it! On top of our core product offering of four systems we also work with contract manufacturers to develop custom enclosures, data acquisition cards, etc. where customers have specific requirements. A great example of this is the solution Dell EMC OEM Solutions and Sanmina put together for The Weir Group which we showcased in our Embedded World Booth. In this case Weir wanted to complete predictive maintenance of remote mining equipment and needed the solution to withstand an even more extreme environment, so we developed an explosion proof enclosure which also housed additional I/O to connect to their equipment. It will be interesting to see how the market and conferences like Embedded World change over the coming years. I believe we already began to see a shift at this year’s show with many embedded PC providers attempting to start differentiating through software instead of customization of the hardware. This will be just the beginning as IoT and embedded markets converge and the IoT customers demand significant enterprise level scale. What is your opinion? Do you think the embedded PC market will begin to consolidate as customer demand more scalability of solutions, or do you think the use cases will continue to demand broad customization? Data… is Everywhere in EMEA! Great news Kevin. Here @ Dell Brazil Manufacturing (BRH1) we have already a showcase using Dell edge gateway 5000 running and also other initiatives to come! Yep, companies such as Dell (and others) began to exploit the power of the new CPU. Users could do their customization in firmware and software. An entire product category evaporated in a couple of years. As Dell seriously takes its technology into what is a new and changing embedded computing space, I’d expect to see the same thing. When you can purchase a standard box and customize in firmware and software, the market grows dramatically while the suppliers are disrupted. Let’s revisit in a year and see what’s happening.